Three games out of 4 have been drawn in the 3rd round of the Tigran Metrosian Memorial which is taking place in the Novotel Moscow City hotel and sponsored by the TASHIR group of companies. The only decisive outcome has taken place in the leader's game: Alexander Grischuk continued his impressive series of victories, this time by beating another Muscovite Alexander Morozevich in an impressive, very powerful manner. Given Grischuk's three finishing victories in Baku, his encounter vs Morozevich has become his 6th winning game in a row, this all happening on the elite level. 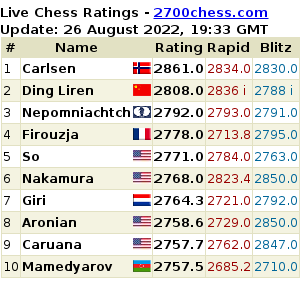 Maybe this is not as yet impressive as the recent 7-games Caruana series in Saint Louis (or, in this connection, the phenomenal series of 20 wins in a row by legendary Robert Fischer in 1970-1971), but it says a lot about the Grischuk's playing level anyway, all the more his series hasn't been interrupted yet. Only a very few GMs in the world are currently capable of performing exploits like this one. 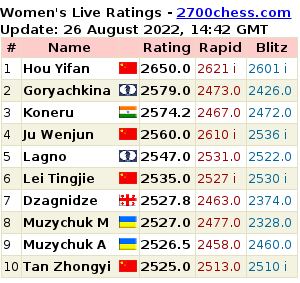 Grischuk's live rating is now equal to already 2807 points. The 3rd round has started from the visit by President of Armenia Serzh Sargsyan who made the first symbolic move in the game between his compatriot Levon Aronian and the Chinese GM Ding Liren. The aforementioned game has been drawn, as well as Leko - Kramnik and Inarkiev - Gelfand. All of these encounters were quite even; Aronian was trying to convert an extra pawn in the endgame but his task was too hard, given his doubled pawns and the persistent defence by the Chinese. Now let's see the game which has been the most interesting in terms of both the sporting meaning and the chess contents. Grischuk: 'If White is able to complete his development he'll be clearly better. The question is, whether White has enough time for it or not. In the game, I've got the time'. 7...Bg7. From now on, Black could have taken the e4-knight himself (without waiting for Nxf6+), and it looks like he had to go for this. 8.Be2 0–0 9.0–0 Bf5 (9...Nxe4 10.Qxe4 Bf5 11.Qh4 e5!? - Grischuk) 10.Nxf6+ Bxf6 11.Qb3 Qc7. This defence is very natural, but probably the position was calling for more energetic measures: 11...Nd7!? (having ...Qb6 in mind), and if 12.Qxb7 then 12...c5!. The immediate 11...c5!? was also interesting. 12.h3! A seemingly modest but actually very strong move preventing Black from completing his development, as the f5-bishop will be in a kind of trouble after ...Nd7. 'Black's position is now unpleasant' - Grischuk. 12...c5?! If 12...Nd7 (12...Be4 13.Ng5!) then 13.g4 deserves attention: 13...Be6 (in case of 13...Be4? the black bishop is kind of trapped: 14.Nd2 Qf4 15.Nb1! Qd6 16.Nc3 Qe6 17.Be3! ?, and it's hard for Black to untangle his pieces), and then 14.Bh6 Rfd8 15.Qe3. However, Grischuk was intending to play just 13.Be3, keeping the g2-g4 idea in stock. 13.d5 a5. 'This eccentric solution is in fact the sign that Black is not okay' - Grischuk. One can even say that this is the strategic capitulation. The alternative was 13...h5 in order to prepare ...Nd7. 14.Bh6!? Re8 15.g4!? Bc8 (15...Bd7!? with the idea of playing ...Na6 if needed) 16.Rad1 Nd7 17.Rfe1 Ra6. White could think of 18.Qa3!? here and on the next move, but Grischuk's decision to sacrifice a pawn for the attack turns out to be very promising. 19...Bxb2. If 19...Rxb2 then the following line looks logical for White: 20.d6 Qd8 21.g5 Bh8 22.dxe7 Qc7 23.h4, intending Bh3 at some point. 20.Bf4! Qd8 21.Ng5! Bd4 22.Qg3. White's threat is now to trap the queen by 23.Bc7; another possible way was 22.Rxd4!? cxd4 23.Qxd4 f6 (23...h6 24.Bd2! with the idea of 24...hxg5 25.Bxa5) 24.Bd2. 22...e5 23.dxe6 fxe6 24.Bg2! (White's advantage is undoubted) 24...e5!? 25.Bd2!? Grischuk had a wide choise here: 25.Bxe5!? ; 25.Bd5+ Kg7 26.Qh4 Nf8 27.Rxd4! ; 25.Qh4! ?, all these lines might be even stronger then the text move, although they require precise calculations. After some thought, he has decided to avoid forced lines in favour of the simple solution, attacking the a5-pawn. Black's position remains very difficult, even though there is not immediate threat of Bxa5 because of Qxg5. 25...Rf6. Probably 25...Kg7 was more persistent (26.Qh4? h6). Another idea was 25...Rd6!? preparing to repair the position by giving up an exchange: 26.Bd5+ Rxd5 27.cxd5 Nf6. 26...Nb6? ('if 26...Qb6!? then 27.Nxd4 cxd4 28.Bg5 with big advantage for White' - Grischuk) 27.Nxd4 (not 27.Bg5? due to 27...Rxf3!) 27...exd4 28.Bg5. Now White wins an exchange without losing his initiative. The outcome is clear. 30.Bxf6 (there is no need in spectacular lines like 30.Bd5+ Kh8 31.Qe7! Qxe7 32.Rxe7 Rxf2 33.Bh6) 30...Qxf6 31.Qxf6 Nxf6 32.Rb1 Rf7?! 33.g5 Nd7 34.Re8+ Rf8 35.Bd5+ Kh8 36.Rbe1 1–0 (Annotated by GM M.Golubev). After three rounds Alexander Grischuk is in the sole lead with the perfect score; his nearest rival is Vladimir Kramnik with 2/3 (a point behind). Today is the day-off. Round 4 will be held on November 8th (Ding Liren - Grischuk, Kramnik - Gelfand). The crosstable, pairings, regulations etc.